I got into a workout routine about 4 months ago and yeah, that lasted about a month, if that. I would wake up when my husband woke for work, nurse baby, she’d fall asleep and then I would workout. So then it started to not work. For some reason I began making excuses for myself and not doing it. It was kind of easy to make excuses that my husband and even myself began to believe, especially since Eva wasn’t sleeping well. From birth to about 2 weeks ago (she’s almost 11 months old), she was still sleeping in our room (I think as a result of my fear of her waking Ethan, I didn’t want to move her into their room until I knew she slept thru the night) she would fluctuate sleeping a wide range anywhere from 7, 5,2,4,7,2,3,1 hours at a time. Some nights were torture as you can see. Then one day we were getting ready to go out somewhere and I pulled out a pair of my favorite jeans, which I hadn’t worn since before Eva was born. I was like, “Oh I will so wear these!” And boom, they don’t fit. I felt like I looked like a stuffed sausage. My first reaction was being frustrated. Frustrated they didn’t fit and frustrated I let them not fit. Then I felt depressed. How did I do this to myself? Why did I let it go on this long? I know when I had my son I was back in regular pants a lot sooner. Then I got upset and challenged myself. This was around the beginning of December, which meant we were going to be leaving for our family Christmas vacation. This also meant that our diets wouldn’t be that great…while on the vacation I was talking to friends about making changes and we decided to partake in a “couples biggest loser” competition. I think that this was the fire I needed lit under my hiney! We began the competition on January 12. We weighed in and blah… I am the second heaviest person out of the 6 of us. When I saw the numbers, I kinda wanted to cry, but then I told myself “No. Make it motivation!” So, here I am a little over 2 weeks in and I’m doing/feeling great! My first priority was setting up my work out space. It is a shared space with my sons “classroom” or as he calls it his school. 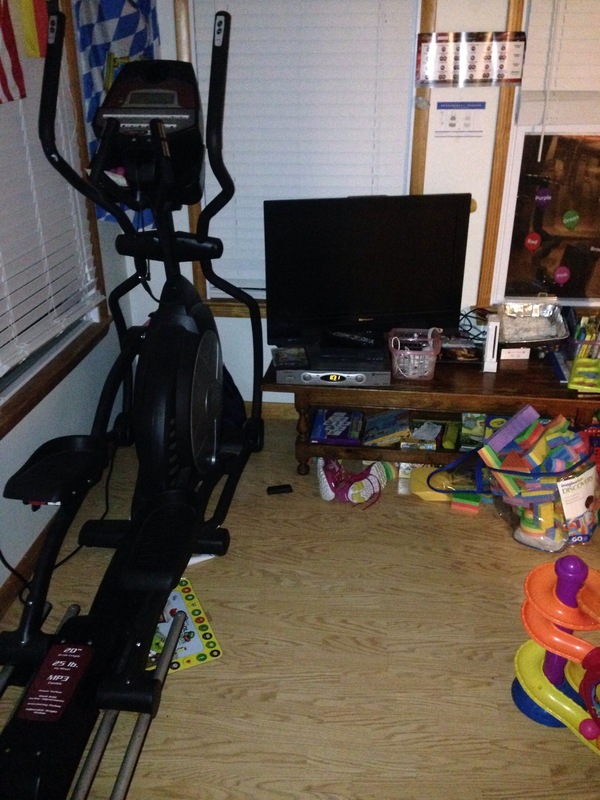 I moved a TV and cable out to the room, purchased a DVD player (both of which can be used for school stuff too), and put all my “gym” equipment in one place. I began working out slowly. I began with a nice warmup and stretches, jumping jacks, 10 minutes a day on my elliptical, light weights for my arms, then crunches and planks. I did this for a week, 5 days. Took the weekend off and then got sick, some kind of virus with a sore throat, wiped me and my appetite out. Pretty much all I ate was smoothies and milkshakes. I had absolutely no energy to work out. I started to get nervous about my focus and determination, but then I thought about the new me and the prize at the end! While I was resting on the couch, I decided to purchase two DVD workouts Hip Hop Abs and a set of Yoga(for flexibility, weight loss and relaxation). This is the first week of beginning a new routine! I have to say I am in love with the Hip Hop Abs, it’s so nice to have the program laid out for me. Plus, I love dancing (I danced from 3 to 19yo). It has a workout chart that tells you what to do everyday. The first day I did it, I burnt over 1200 calories! (I am eating and drinking correct calories for breastfeeding, I have a huge fear of losing my milk, I just know I have to make changes). The yoga DVDs are really helping my balance and flexibility. I somewhere lost a lot of my flexibility over the years, I used to be able to drop a split no questions asked. I am very happy with my purchases! I’ll keep everyone posted about my progress with the DVDs and my physical changes! One of the hardest things about working out as a SAHM is finding the time to work out. Really from the moment I wake up I am doing something for myself, the house, or possibly entertaining an early awoken baby. Once the kids are awake, my focus is mainly on them trying to squeeze in some laundry and cleaning. So on a regular day there are diaper changes, breakfast, school time, snack time, nursing in between all this, lunch, then naptime! The key word-Naptime! Some days I get really lucky and both, YES, both babies are sleeping at the same time! When it does happen, it’s amazing! There are so many things I can get done. Now that I have decided to make excercise an important part of my day, this double nap time is the perfect opportunity. However, some days I don’t get lucky. Sometimes Eva falls asleep a little sooner than Ethan or she may not nap at all. The first time that this happened, while I was trying to work out, I got frustrated and gave up on working out for that day. The next day, it was playing out the same way, one napping, one not. I thought about it and said “Kerry, you’re making excuses… You need to work out!” This is where I had to grab the bull by the horns and bring the kid(s) out to the workout/school room and they can play, while I work out. 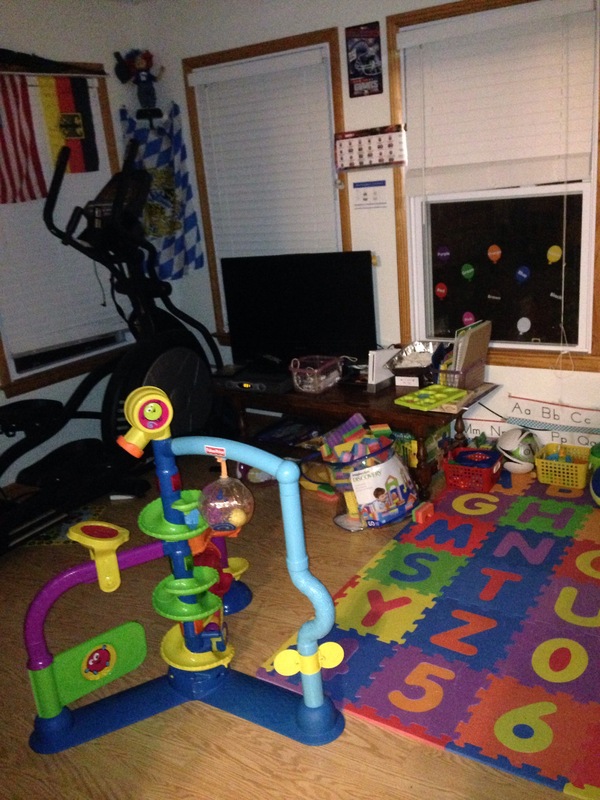 I really REALLY try to get my workout in while Eva is sleeping, it is much easier to keep my son occupied and he understands to stay on his side of the room. This week I got my routine on lockdown! It still needs a little work, but I’m getting there and today I had to totally move it all around, but I still got it in! That’s the important thing! I am super motivated and proud of myself! It may be tricky to find the time to get a workout in there or you may feel like you’re too exhausted too! Squeeze it in there! Trust me, it’s worth it! You’re worth it! Story and get motivated to make positive changes too! *I am in no way affiliated with Hip Hop Abs or Beach Body. I just love their workout DVD!